The Elkay ER101Y Remote Water Chiller is a remote type, electric refrigerated unit with a chilling capacity of 9.6 gallons per hour of 50°F drinking water, based upon 80°F inlet water and 90°F ambient. The Elkay ER101Y is a compact, highly efficient water chiller units are designed for use with any drinking fountain and connects to a bubbler, glass filler or cold water dispenser. The Elkay ER101Y converts a drinking fountain into a water cooler and installs directly under fountain or other application, or may be located in a service area to serve up to two remote outlets (within 15 feet of chiller recommended). Also recommended for photoprocessing, medical or experimental laboratories and a pre-cooler for beverage dispensing. The Elkay ER101Y is certified to be lead-free as defined by the Safe Drinking Water Act. Elkay Water Coolers are manufactured with a waterway system utilizing copper components and completely lead-free materials. The Elkay ER101Y waterways have no lead because all lead materials, such as leaded brass, have been removed. All joints are brazed using silver solder only. No lead solder is permitted. A strainer with an easily cleanable screen is provided to allow trapping and convenient removal of waterborne particulate of 140 microns and larger prior to their entry into the water cooler. Hermetically sealed, reciprocating type, 1/4 HP, 115VAC, 60 Hz single phase. Sealed-in lifetime oil supply. Rated 5.8 Amps, 490 Watts. Combination tube-tank type. Evaporator cooling coil of continuous copper tubing. Tank is stainless steel with a volume of 0.7 gallons. All water contacts stainless steal surfaces. Fully insulated. 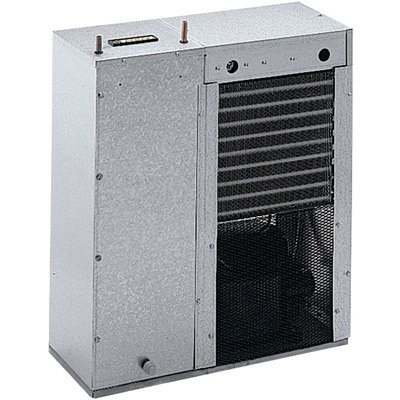 This chiller is provided with a plastic drain plug which incorporates an o-ring seal. This fitting is designed for potable water applications and should be replaced with a suitable fitting if chiller is used with more aggressive liquids.